After yesterday’s experience at the locks with the unhelpful boater Jan has decided anyone in a horizontal top is a ‘wally’! This morning Peter and I appear from our boats only to hear Jan call out “You couple of wally’s!” Oops… both wearing shirts with horizontal strips. The problem was quickly solved by donning a fleece. We quietly slipped away from the moorings leaving the neighbours in bed. 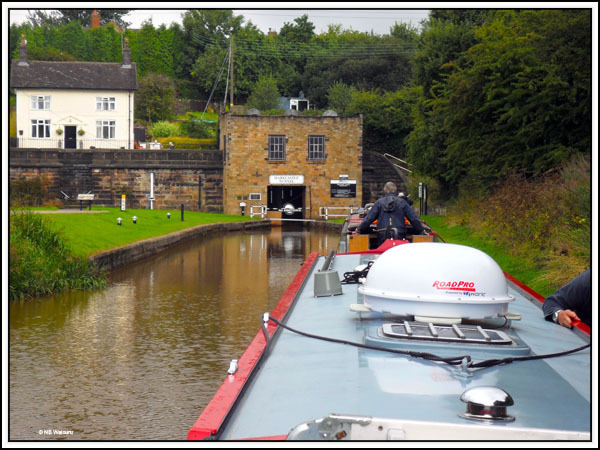 We topped up the water tank before cruising towards Festival Park Marina. Being a Saturday morning it was rather chaotic with hire boats returning from every direction. 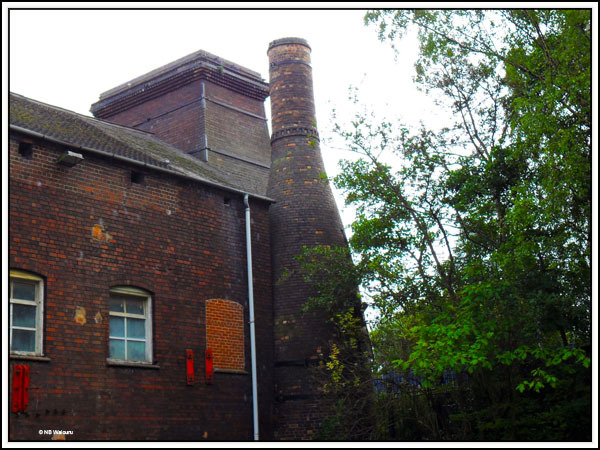 The bottle kilns continue to fascinate us although the kiln in the following photo appears to be thinner than usual. 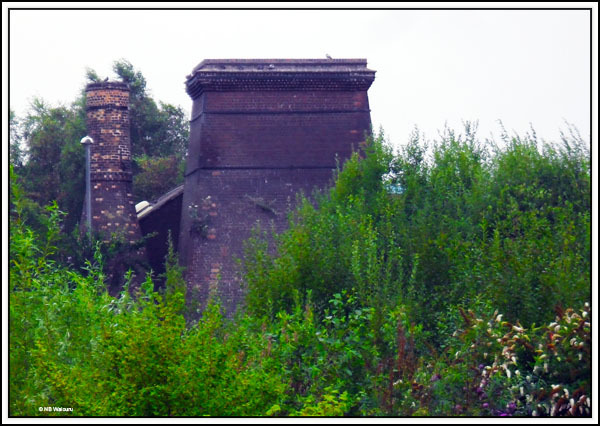 The adjacent large rectangular chimney also looked interesting. 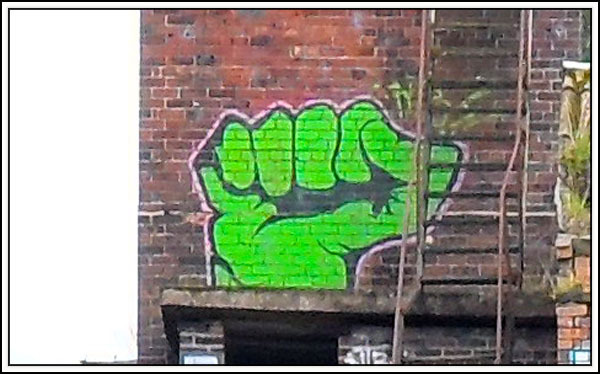 One building has a graffiti in the form of a large green clenched fist. Does it have any special significance? A couple of boats pulled out in front of us as we approached Westport Lake on our way to the Harecastle Tunnel so we knew we wouldn’t be going through on our own. There were three boats waiting when we arrived and one arrived after us, so that made six boats going through. The Tunnel Keeper told us there would be a 30 minute wait as one boat was already in the tunnel coming towards us. This Harecastle Tunnel is starting to become a habit! Don’t argue with me…. I’m the Tunnel Keeper! 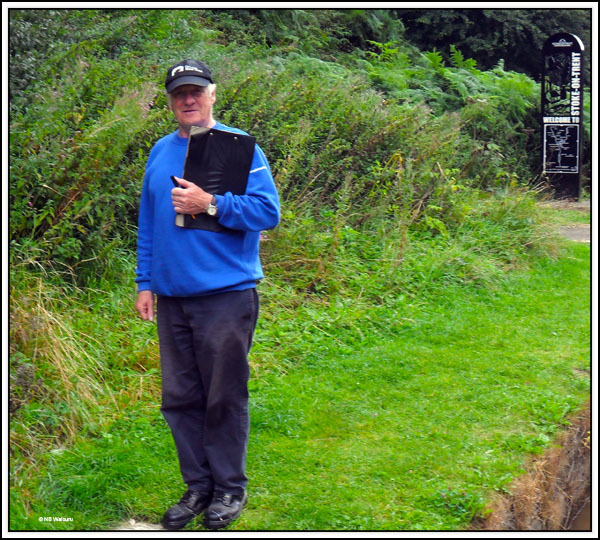 We’d already warned Peter & Margaret that we’d developed a habit of singing our way through tunnels (me badly off key) However before I could tune up my vocal chords we could hear loud whistling behind us from Peter on nb Kelly-Louise. Heaven knows what the poor buggers ahead of us thought as the singing and whistling continued. It took us approximately 40 minutes to get through the tunnel which is much faster than the previous trip a month ago! It was at the other end we came across “Wally”. Two boats ahead of us had used the two locks at the top of the Red Bull flight. Peter and I were loitering above the locks in front of the junction to the Macclesfield Canal waiting for the locks to be free when the boater behind Peter called out “Are you going to Macclesfield?” Peter called back “No!” The boater behind then called out “Well get out of the way!” Not only was the tone rather rude but it proved to be a bit of an issue because there was only room for one boat on the lock mooring. 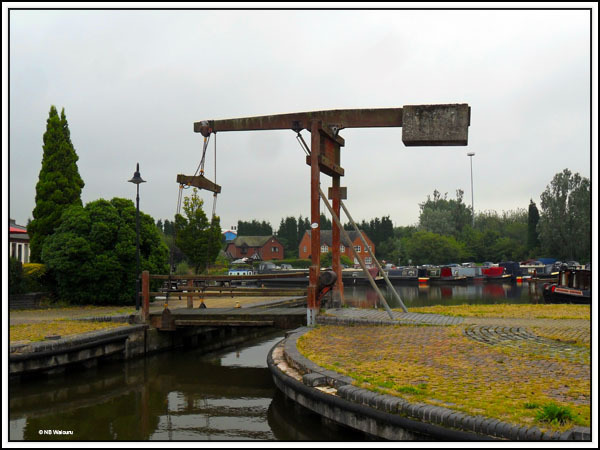 Eventually the boater made his way behind me and called out “You know there are two locks!” The locks are co-located it’s fairly obvious there are two! The inference was I’d been too stupid to notice the second lock. 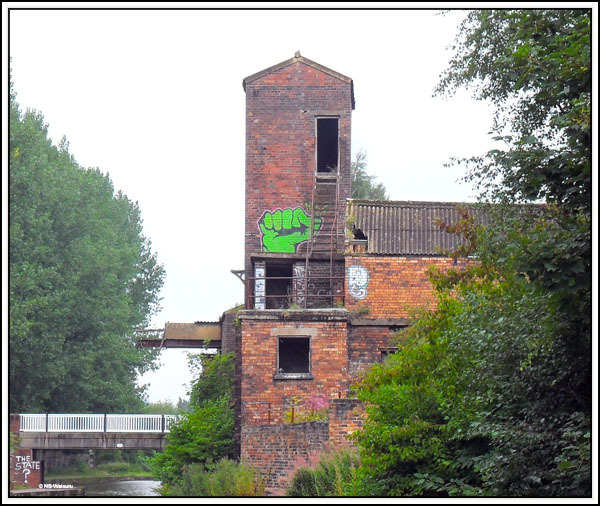 I replied “Yes… and they are both occupied!” Fortunately that was the last we saw of Wally! After lunch we raided the local Tesco supermarket. Jan watched me like a hawk and I was only able to sneak one tin of shoe polish into the trolley. Later I spent some time finishing the washing and polishing of the starboard side. You polish the boat with ... SHOE polish?? ?